The 1804 election took place during a brief hiatus in the French Revolutionary War abroad, resulting in booming international trade. Additionally, Thomas Jefferson’s decision to buy Louisiana Territory from Napoleon opened cheap land out West for settlers. 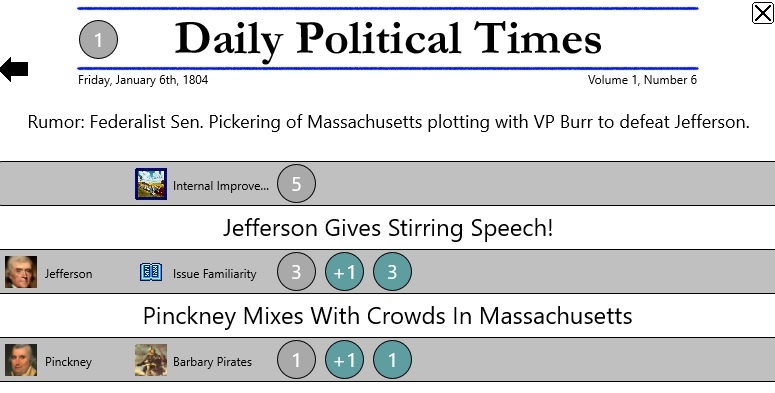 As such, Jefferson’s popularity was arguably at its peak. Therefore, Jefferson’s renomination and reelection was virtually assured. Meanwhile, Federalists were in disarray with only New England and New York having any semblance of an organized party. New England Federalists so opposed Jefferson that many of them, led by Sen. Timothy Pickering, hatched a plan to work with VP Aaron Burr to secede from the country if Jefferson won reelection. However, many notable Federalists, including Alexander Hamilton, opposed the scheme. Thomas Jefferson sought reelection without contest from his party. Federalists were unable to convince any sort of superstar from running; therefore, they settled for last election’s VP-nominee, Charles Coatesworth Pinckney, whom they thought would father Southern support. Meanwhile, the Northern secessionist plot failed badly. Secessionists banked on incumbent VP Aaron Burr winning the gubernatorial election in NY, and hoped that Burr would then align with New England and break off from Jeffersonian America. However, Alexander Hamilton thwarted both Burr and his fellow Federalists by working against the scheme and Burr’s election. Ultimately, Burr and Hamilton agreed to a duel over a lifetime of grievances against one another, resulting in the mortal wounding of Alexander Hamilton. Rumors of Burr’s dissatisfaction with Jefferson, rumors of his possible collusion in a secession plot, and his killing of Alexander Hamilton, resulted in Jefferson dropping Burr as his VP for another New Yorker, George Clinton. New England would make another secession attempt during the War of 1812, nearly a decade later. On election day, Jefferson trounced Pinckney, 72.8% to 27.2% in the greatest popular vote landslide in a contested election. Additionally, Jefferson won four of the five New England states, including Massachusetts. 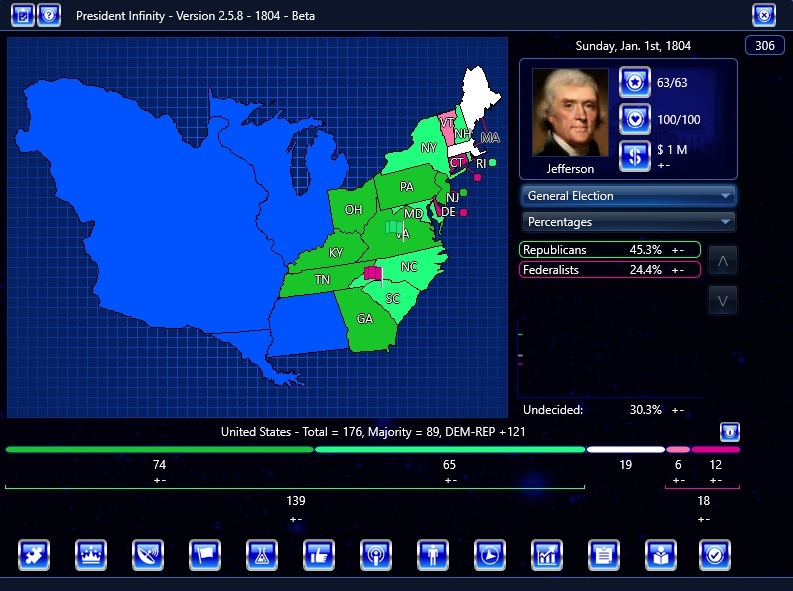 Clinton helped Jefferson win New York. Only Delaware and Connecticut chose Pinckney. 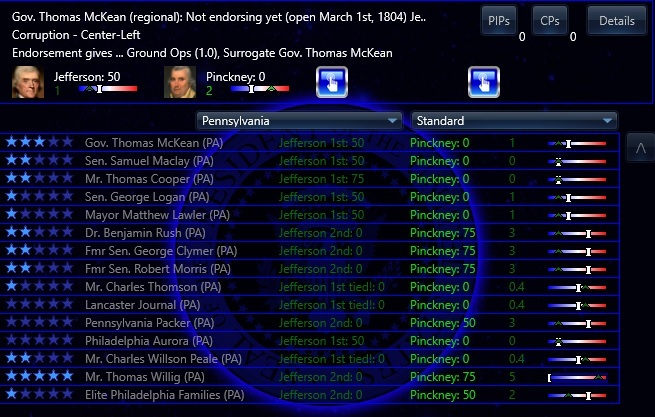 Why not test your skill by attempting to defeat Thomas Jefferson with Charles Coatesworth Pinckney? What if George Clinton, Aaron Burr, or Elbridge Gerry contested Jefferson’s nomination with the support of Northern Republicans? What if James Madison became impatient and aimed to win the nomination for himself? What if conservative Republicans had rallied behind James Monroe in 1804? What if Alexander Hamilton ran for the presidency and survived his duel with Aaron Burr? What if other Federalist superstars, such as John Marshall and John Jay ran? What if John Adams sought a non-consecutive second term? What if John Quincy Adams aimed for the presidency in 1804? What if Gouverneur Morris or Henry Lee ran for the Federalists?